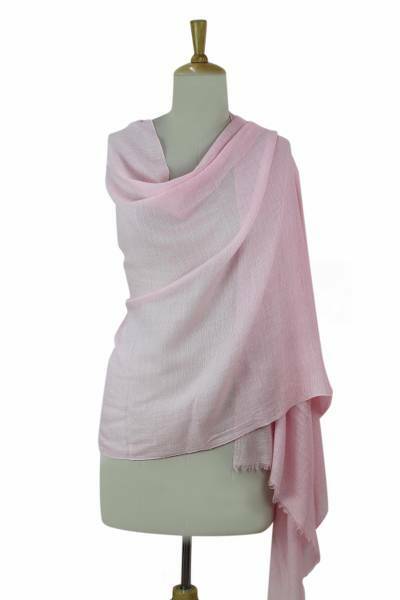 Women's Pink Wool and Viscose Blend Woven Shawl, "Pink Diamonds"
The region of Kashmir in India is well-known for its ancient weaving heritage, and NOVICA artisan Sajad upholds that tradition. Soft and subtle, this wool and viscose blend shawl goes wherever you do. The petal-pink wrap features the traditional all-over chasm-e bulbul diamond pattern and drapes beautifully. You can find wool blend shawl 'Pink Diamonds' by Sajad in accessories categories such as Viscose Blend Shawls, Viscose Shawls, Wool Blend Shawls and Wool Shawls. Enjoy exploring these sections for other Novica treasures.